Extra time was given at the awards event to explain a new program feeding youth on the weekends. More than $10,000 was handed out to charity, and that wasn’t even the highlight of the night for a few hundred who gathered in Fort Langley Thursday evening. For six Langley youth in the crowd (the seventh couldn’t attend), it was an opportunity to be singled out for their service above self. For the second year running, Langley Rotary Clubs hosted the SASSY (Service Above Self Student Youth) Awards, a relatively new recognition program that spotlighted youth who exemplify leadership in seven different categories. 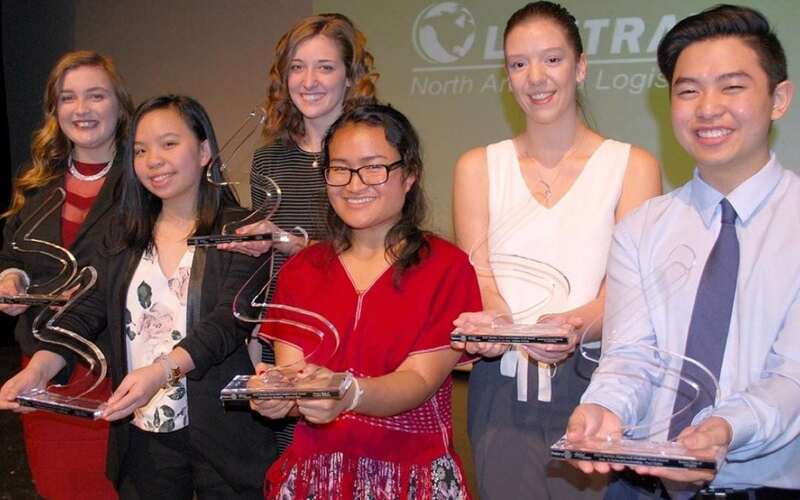 It celebrate young people, ages 15 to 21, who are living in or attending school in Langley and are “making a difference in our community by demonstrating the Rotary ideal of service above self,” said emcee and past SASSY recipient Alix Way. Each award recipient receives a $1,000 bursary towards their post-secondary education, as well as a stylized glass SASSY Award. “You’ve been forewarned, this will be an inspiring evening,” Way told the packed house who came to watch the youth-driven event at Chief Sepass Theatre. In the category of sports leadership, Leslie Rude is a 17-year-old from D.W. Poppy Secondary who was recognized for her efforts in volleyball and other sports. On the international service front, Walnut Grove Secondary Hannah Lindsay (who couldn’t not attend) was lauded for her efforts to bring books to a Haiti orphanage. It’s a cause she undertook when she was in Grade 6, and continues today. Fifteen-year-old Jasmine Lee, an R.E. Mountain Secondary student, was picked as the environmental leader for the work she’s done in her school’s aquaponics club, but also to honour her efforts at introducing a similar program at Yorkson Creek Middle School and other schools in the district. As for youth leadership, the award was given to 17-year-old Ashley Haines of Brookswood Secondary for her work in multiple youth-oriented projects. Paul Kaita’s passion for art and drawing earned this 17-year-old Brookswood Secondary student the arts & culture performance award. In part, he was applauded for his work creating stage backdrops, murals, and even teaching classes. Daynery Moo is an 18-year-old Langley Secondary School student. Daynery was born and raised in a bamboo house inside a refugee camp in Thailand and recounted how “challenging” it was to move to Canada as a young girl, and further, how difficult it was to communicate with teachers, classmates, and others because she didn’t know a word of English. She was selected to receive the overcoming adversity award. And last, but not least, is Katrina Schulz. She is a 17-year-old from R.E. Mountain student who brought home the community service award and was also given an opportunity – along with a few friends – to talk about their leadership role in creating and growing the Weekend Fuel Bag program. Each year, SASSYs try to use the recognition program to also draw attention to a major issue facing the youth in Langley. Last year, the youth chose to focus on the issue of youth homelessness in Langley. The student-driven efforts proved a catalyst to creating a hub for young people at risk. A facility will be erected later this year to offer much needed shelter beds to those local youth currently living on street or couch surfing in questionable conditions. This year, the focus was turned on youth-at-risk and specifically the help needed to sustain and grow the Weekend Fuel Bag program. As a semifinalist, Schulz chose to give her $500 donation to the School District Foundation for the Weekend Fuel Bag program. She noted how the foundation came through for the Fuel Bag program when they had only $3 left in the bank and 16 students to feed. The hope, she said, is to extend to the remaining four seniors schools in Langley this school year, then look at spreading it throughout the full calendar year – including summer vacation. There’s even talk, she hinted, to broadening the program horizons to included neighbouring school districts, such as Surrey. “I know that students don’t necessarily do this for recognition,” Langley School District superintendent Gord Stewart said. Rotarian Rod Wainwright was one of the founding members of the Langley SASSY Awards, who helped mirror a program – now in its seventh year – in White Rock. For Wainwright, the program is all about demonstrating leadership in the community. First, it speaks to the leadership of the Rotary clubs for seeing the value in such an initiative and agreeing to come together to host the awards in Langley. But moreover, it’s about the hundreds – if not more – students and youth in the community who are deserving of acknowledgement for all they do. “They are our leaders of tomorrow,” Wainwright said. “Service Above Self Student and Youth, that’s what it’s all about… there are some fabulous young people in the Langleys, and they need to be recognized… take a look at the young around you. We’re in good hands,” he concluded. Andria McAulay has taken on the organizational role of the awards evening for the second year running, in part – she jokes – because she’s still classified as at age 29 as a “youth” by most of her fellow Rotarians with the Rotary Club of Langley Sunrise. There were 43 nominees for this year’s SASSY Awards, 21 of which were shortlisted as semifinalists. “We found ourselves in awe of these nominees,” she said. McAulay was impressed herself, but she also heard similar sentiments expressed by all the judges and volunteers involved in preparing for this year’s SASSYs. And despite all the hundreds of volunteer hours it has taken by an army to pull this all together, McAulay said she’s thrilled to be part of a program that spotlights the great things youth are achieving in the community. The evening, emceed Way, also included brief video presentations from each of the 20 nominees. And it incorporated a series of cheque presentations, with $500 being given to each of the semi-finalists charities of choice. The donations had to go to Canadian charities, and was presented to the organization on the students’ behalf. It’s a huge “give back” component to the night, explained Daniel Bennett, the other co-founder for the Langley SASSYs. The night also included youth performances by 14-year-old Cooper Yarosloski of Circus Lab, as well as group performances by dancers from Street Kings and Studio One. “The SASSY Awards were established to celebrate youth achievement and honor those in our community who are making it better,” said Way, a proud SASSY alumni. “This is way for us to unite everyone in Langley and acknowledge the efforts of some incredible youth,” she elaborated, noting the long-term plan with SASSY is to create a way of bridging the gap and giving a hand-up to the at-risk youth in Langley and bring them into projects with some of the youth recognized Thursday. Nomination forms are expected to be on the SASSY website soon for the 2018 awards at sassyawardslangley.ca.